Often known as simply Carlos Lopez, he was born in Chiquinquirá, Boyacá, Colombia. He came from a well-connected family who didn’t want him to become an artist. He began his career drawing cartoons for newspapers in Bogotá, while working in the War Ministry from 1944-1951. In 1948 he exhibited two art works at the first annual group show with artists from Boyacá, he showed a drawing and an oil painting. By the early 1950’s he became well established as an illustrator and caricaturist in Columbia. In 1952 he left Columbia for the U.S. In 1953 he began a two-year scholarship at the Corcoran Art School in Washington D. C. He was awarded first prize for oil painting in a collective exhibition at the school. In the next five years he spent time studying the old masters and modern art in museums and galleries from Philadelphia to California. In 1956-57 he had several solo shows in Washington D.C., and in New York City, including the ArtSmart Gallery and the Corner Gallery. In 1957 he retuned briefly to Colombia to participate in the 10th annual show of Columbian artists. In 1959 he moved to Ajijic Mexico. During his time in Ajijic, he had several exhibitions in Guadalajara and well-known local galleries. In these years he met and lived with a local artist Eleanor “Tink” Strother, they exhibited together in several cities in Mexico. 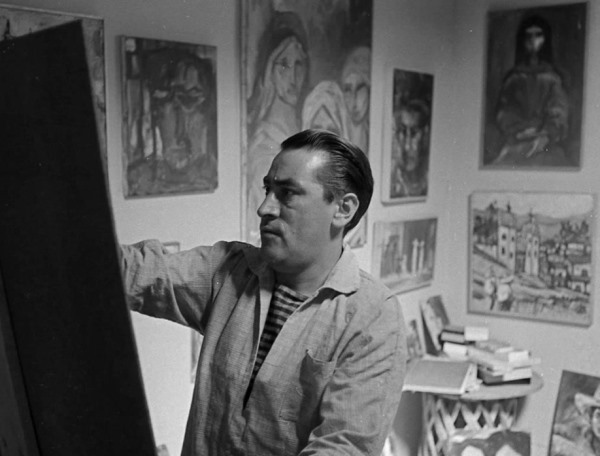 In 1962 he had a one-man exhibition in Colombia at the Galeria El Automatico in Bogota where he exhibited twenty oil paintings. Tink and Carlos left Mexico and moved to California in 1963-64, where they opened a joint studio and gallery in 1972 in Pico Rivera, near Los Angeles. Carlos Lopez Ruiz lived in Whittier, California until his death in 1972.